If you suffer from dull hair, itchy roots, excess oil or even hair loss, an unhealthy scalp may be the cause! Healthy hair comes form a healthy scalp, so its extremely important to focus your attention on how to take care and maintain a healthy head of hair. At Caralyn’s, we have the best scalp experts, that can help diagnose scalp issues, and what products to use to improve. 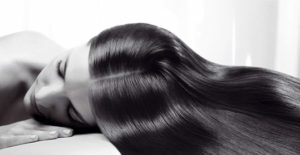 Daily Brushing: Gently brushing your hair is a great way to stimulate your strands and spread excess oils. It will remove any dead flakes up top and prevent clogged hair follicles. Gentle Shampoo: Use a natural, cleansing shampoo and avoid harsh scents and ingredients. Try to shampoo your hair every 2-3 days, rather than every day to avoid stripping your scalp of natural oils. Conditioning: Despite what you heard, conditioning the scalp can actually be beneficial to your hair – especially if your scalp is on the dryer side. Since shampoo is a cleansing product, it will remove any oils, where the conditioner will replace the moisture and return the scalp back to a natural balance. If you are need of more assistance that the regular scalp upkeep, Caralyn’s has a wide array of scalp treatments to further recoup your scalp’s health and get you back on track to healthy, beautiful hair!